In terms of things to do in Pisa, I wasn’t sure what to expect when I booked an overnight stay in the city before travelling to Florence. 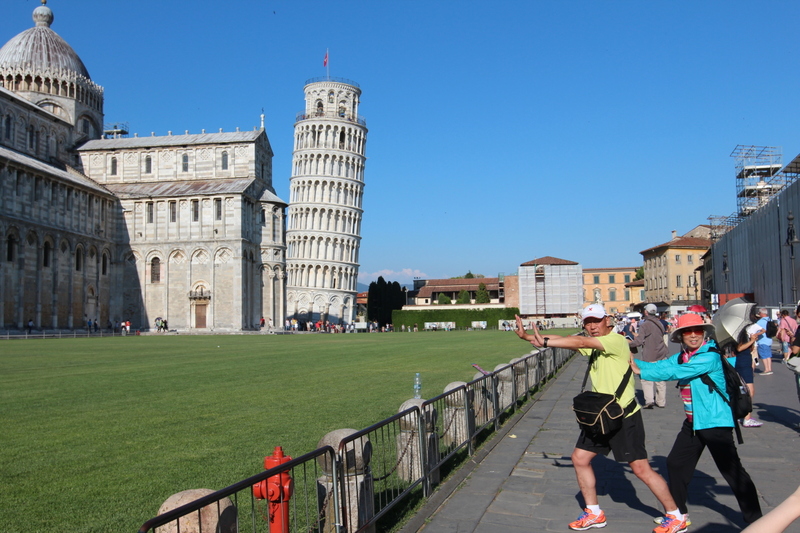 I’d imagined a day whipping around the obvious sights; haphazardly taking a photo of me pushing up the Leaning Tower before heading off to my next Tuscan city. I was concerned that, amongst the tourist scrum desperate for their iconic tower photo, that the city might be a little disappointing. Our brief 24-hour stay in the city, however, turned out to be one of my favourite day trips from Florence. A busy University city, there are plenty of things to do in Pisa for a short weekend break. From the UK, we took an Easyjet flight to Pisa (Galileo Galilei Airport), from Luton airport. A cheaper alternative compared to Florence airport, Pisa makes for the perfect budget city break. The average cost of return flights to Pisa from Luton is under £150. As we were driving around Tuscany, we picked up our car rental at Pisa airport and drove into the city. Driving in Pisa, however, isn’t for the fainthearted. Navigating the strict one-way system is stressful and with the airport only 10 minutes out of the city, public transport should be your preference if possible. The airport bus departs from the entrance of the airport every quarter of an hour and takes 10-15 minutes. Slicing the city in half, with the historic centre to the north, and the suburban area to the south, River Arno is a prominent feature of Pisa. In fact, a stroll along the river’s winding banks is a must when visiting the city on a sunny afternoon. As we made our way down its banks, the route was busy with University rowing teams out for practice and groups of friends lazing in sunny patches. A respite away from the city’s central attractions, exploring the banks of River Arno was an unexpected highlight. A full walking route for the River Arno can be found here. After a lazy lunch in the shade, we prepared for our pilgrimage to Piazza dei Miracoli, where Torre Pendente (the Leaning Tower) resides. Ready to face the selfie sticks and seas of tour guide umbrellas, two things stuck me as I cautiously rounded the corner into the Piazza. Firstly, compared to other major Italian tourist spots, the Piazza was strangely calm; people lazing in the grass, reading books or playing with their dogs. Yes, there were the groups of selfie stickers, but I’ve survived far worse as a tourist in Italy. Secondly, I was struck at just how leaning Torre Pendente actually is. Ironic I know, but it’s surprisingly, well wonky, standing at a whole 3.9 degrees off to the side. Entering the ground floor of the tower, you’re immediately thrown off balance – I walked off sideways before finding a spot to sit down. What I liked about this particular tower (after climbing up eight different towers over the course of a week) is that the trips up are staggered every fifteen minutes, so you don’t have hoards of people crushing you on the way up or once you’re at the top. Walking up the tower is equally as disorientating, dependent on whether you’re on the leaning side or not. Once I’d made my way up the 294 steps, the views from the top of Pisa were enjoyable (or so I understand from people who don’t suffer from vertigo). I spent most of my time staring at the inside of a wall, convinced the very prominent lean up the tower was going to result in my tumbling off at any moment. I did attempt to move around half of the tower but froze next to a fellow tourist, who kindly escorted me back to the stairs so I could make my escape. The piazza is also home to Pisa’s Duomo (free entry but you still need to buy a ticket) and the baptistry, where Galileo Galilei was baptised. My favourite thing about the trip to this famous Piazza was not the monument itself, but the tourists (myself included) scattered around trying to get that photo. Watching people stagger around, pushing against air or pointing at air was nothing short of comedy gold. After getting our fix of the leaning tower and taking an inconceivable amount of photos of us propping it up, we decided to escape the crowds and go on another wander. You can buy your tickets for the tower here and can be booked up to 30 days in advance. Tickets cost 18 euros. 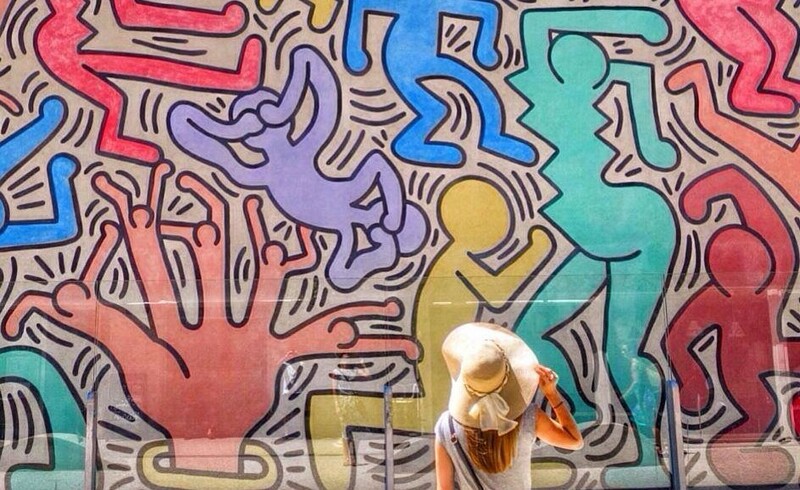 Scurrying into any shade we could find, we unexpectedly came across an amazing piece of street art: the Keith Haring Mural ‘Tuttomondo’ – the last public work by the artist in 1989 before his death. This colourful mural is packed with different characters, which in the main, are there to represent harmony and peace in the world. Pisa, being a University town, is filled with street art and I loved spotting subtle graffiti hearts on street corners. It definitely gives the city an edgier and younger feel compared to other cities in Tuscany, such as Florence. After a long afternoon nap – we had got up at the unearthly hour of 3.45am to catch our flight – we headed out to enjoy Pisa by night. Another great benefit of Pisa being home to such an elite University and young crowd is that there’s plenty of affordable bars and restaurants. It has a more genuine and local feel to it, rather than a tourist spot, and is another aspect to Pisa that was pleasantly surprising! We ate in a lovely, quiet Piazza with the smell of Jasmine and roses wafting on the summer breeze (I know, cheesy but it really was) and I treated myself to my first plate of pasta (one of many on this trip). The perfect end to our 24-hours in Pisa was grabbing some gelato and taking one final stroll down the Arno river to enjoy the twinkling city by night. Before heading to Florence, we decided to take a day trip from Pisa to the charming city of Lucca. 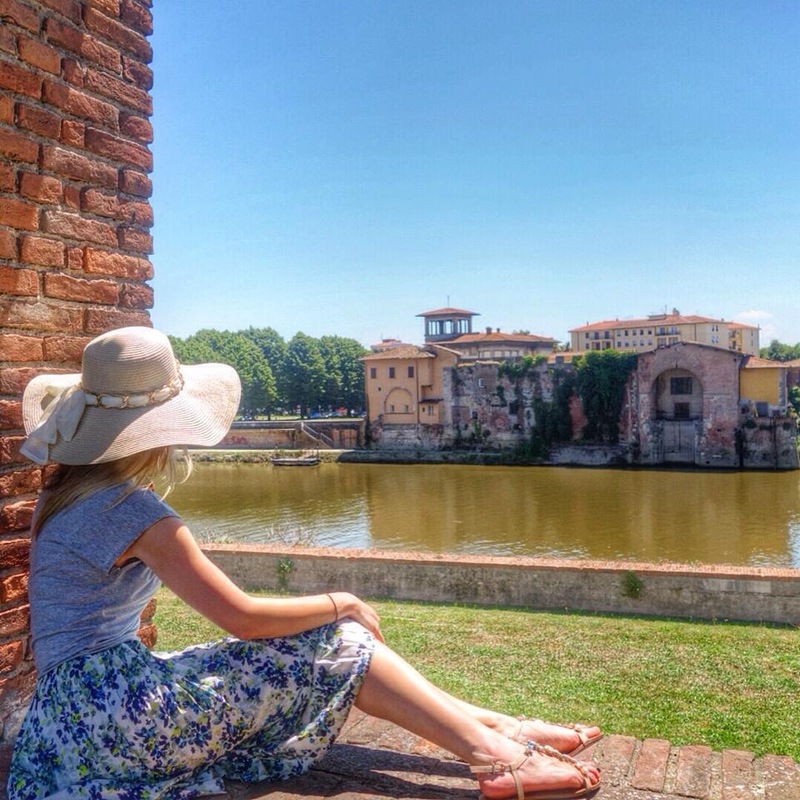 Located north of Pisa, a quick 30-minute car or train journey, Lucca provides a refreshing break away from the larger, tourist hotspots of Pisa and Florence. The birthplace of famous composer, Puccini, this historic city is housed snugly inside its original, and surprisingly intact, medieval wall. Ideal for a gentle stroll through the cobbled streets to the city’s church, Cattedrale de San Marino before a long, lazy lunch at a nearby cafe, Lucca is a city to explore at leisure. For opera lovers, Puccini e la sua Lucca offers frequent evening performances (particularly in the summer when concerts are held nightly). Housed in a local church, and for just 20 euros, this is the ideal way to enjoy some world-class opera in Puccini’s birthplace. Note: if you’re catching the train to Lucca, the final train back to Pisa is at 9pm. Hahaha that photo is way too funny! Read this for a little bit of Tuscan inspiration whilst holiday planning- i think i’ll go just to re-inact that photo myself!!! !